Having been a small and quite isolated language for centuries, Siwu was relatively late to attract attention from outsiders. Europeans in search for gold, slaves, and other goods for the most part stayed near the coast. Halfway the nineteenth century, German firms (looking for cheap land) and missionary organizations (looking for converts) started to explore the Hinterland and it is in this period that the name Akpafu turns up for the first time in the historical record. (If you wonder about the etymology, see here.) 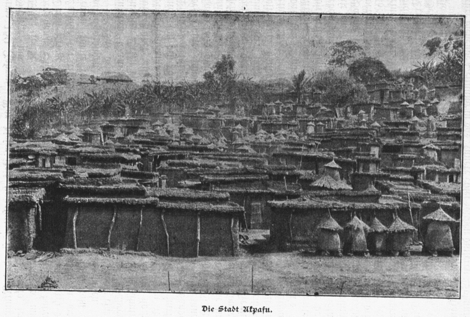 The earliest mention I found so far is a photo by the German missionary photographer Christian Hornberger, titled Fetischpriester in Akpafu and dated 1864 (see below).2 Still, it took some time before Akpafu became more generally known, due in part to its remoteness, but probably also because of the turmoil caused by the Asante-British wars. Only when the area became part of the German colony of Togoland (1884-1914), more information became available.3 The earliest ethnographic source is a study by Rudolf Plehn, published as his dissertation in Halle in 1898 and titled Beiträge zur Völkerkunde des Togo-Gebietes (Contributions to the ethnography of the Togo area). It is here that we find the oldest fragment of Siwu to appear in print, and in this posting I’ll report on an attempt to decipher it. This is the first Akpafu song taken down by Plehn. We’ll scrutinize transcription and translation soon enough, but let’s step back for a moment and ask ourselves what we can infer at this point. Well, most importantly, there must have been some shared code. This implies some bilinguality on part of the Mawu. The Mawu, of course, were well known for their ironwork (their products were distributed throughout all of today’s Volta Region), and trade was probably conducted in Ewe, this being the dominant regional language then just as now. In all likelihood, Plehn had a smattering of Ewe like so many Germans in this part of Togoland; or he may have brought guides who served as interpreters. In any case, it is worth keeping in mind that the meaning attributed to these Siwu words most probably passed through some trade register of Ewe before being written down in German. Now, what do we have? It is a prayer to the deity to find a man who has been lost. Going through these old specimen of the language together with my landlord Rev. A.Y. Wurapa, born in 1926, was an exciting experience. I would read Plehn’s transcription aloud and he would repeat the words, rolling them over his tongue, tasting them like a good wine, gently bending the pronunciation to find possible readings, trying to find words that were at once compatible with the aural contour and with the meaning provided. Eyes closed, head turned slightly upwards, he sat “Ofiabeabe… ofi abe abe… ofiabe abe … ɔpi abe abe…”, then all of a sudden opened both eyes and said “ɔ-̀pia àbe ame” — ‘he is in the mountains’. Bang! A glimpse of insight reunited the sounds with the linguistic system they were part of, bridging a gap of 110 years. It turned out that this was the easiest part. After this, we really had to slow down. I went back to the German translation, improved my paraphrase of it, and recited Plehn’s syllables as best as I could, taking into account the prosodic marking. My assistant would shake the head and focus on his own vocalizations. After much probing, we found a perfectly fine serialized construction ‘try and find’ with the verbs la ‘try’ and nyɔ ‘look for, search’. The second person plural pronoun mì was an almost perfect fit with this, so we got the imperative mì-la mì-nyɔ ‘you-try you-search’ for Plehn’s mela menyo. Siwu does not have phonemic /z/, so we decided this had to be /s/, giving us the common particle si, glossed with ‘if’ below but performing a host of other functions. My elderly assistant proposed that Plehn’s bo might well be the verb bo ‘reach, enter’. Then we grinded down to a halt. I hate to say it, but we were unable find a good match for Plehn’s first syllables.7 In the end, we resolved to create a reconstruction of the meaning in ‘closest natural Siwu of today’. So I will close this week’s posting with an incompletely deciphered version of Plehn’s song and with the promise to do some more sleuthing during the next field trip (February-March). This is not the last you heard about this! It turns out there may be some codeswitching going on after all. In a footnote I wrote that we briefly considered reading Plehn’s yena as the Ewe verb yi ‘go’ plus the habitual na, but dismissed the possibility because it didn’t seem to make sense to have codeswitching in a song. However, Felix Ameka has suggested that Plehn’s yenabó might indeed correspond to the common Ewe construction yina kpó ‘go look’. In Ewe, this construction would be normally followed by an if-clause, and sure enough, we do have an if clause here — except it’s in Siwu. It is a plausible reading, especially because it works out nicely with the tones. By sheer serendipity I have since managed to retrieve a fuller version of one of the songs written down by Plehn. It turns out to be part of a worship cycle for the Mawu deity Tokpaikɔ, as described by Francis Agudze. Details here. Alsheimer, Rainer. 2004. Bild als missionarisches Traktat. Protestantische Fotos des 19. Jahrhunderts aus Westafrika. In Fotografien vom Alltag – Fotografieren als Alltag, ed. Irene Ziehe and Ulrich Hägele, 149-166. Berlin: LIT Verlag. Bürgi, Ernst. 1921. Geschichte von Station Akpafu, 1897-1917. Unpublished account from the Archives of the Norddeutsche Missionsgesellschaft. Plehn, Rudolph. 1898. Beiträge zur Völkerkunde des Togo-Gebietes. Mittheilungen des Seminars für Orientalische Sprachen 2, part III: 87-124. Rattray, R. S. 1916. The Iron Workers of Akpafu. The Journal of the Royal Anthropological Institute of Great Britain and Ireland 46:431-435. Seidel, A. 1899. Beiträge zur Kenntnis der Sprachen in Togo. Zeitschrift für Afrikanische und Ozeanische Sprachen 4:201-286. 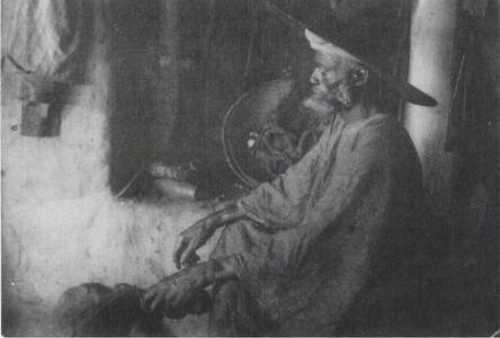 If you wonder about the low quality of the image: this is a scan from a photo found in a piece by missionary Herman Schosser published in 1907 as volume 21 of the Bremer Missionsschriften (Schosser 1907:6). I have not yet been able to track down this picture in the Bremen Mission Archives, so it seems this is the best we’ve got. This entry was posted in Anthropology, Early sources, Fieldwork, Siwu by mark. Bookmark the permalink. I love this peace of history l just read I live in Australia thanks published more if these so we would be educated.